The use of white noise to put a newborn to sleep may seem counterintuitive, however, white noise helps to emulate a familiar setting for your newborn. For the nine months that baby develops in the womb, she is exposed to a multitude of sounds. The womb is quite a noisy place to develop, as baby hears your voice and the voices around you, in addition to any surrounding music or noises. Many new parents attempt to keep the house quiet when Baby is sleeping, however, employing a white noise machine may help your baby sleep better through its ability to emulate the womb experience. By creating a constant stream of noise with a white noise machine, you are able to drown out other sounds that may disturb baby while he attempts to fall asleep. Similarly, sounds of the dishes or siblings running around the house will not be heard over the white noise machine, allowing baby to stay asleep. Many parents can be heard “shushing” their upset baby. This “shushing” sound is an imitation of the sounds heard in the womb. 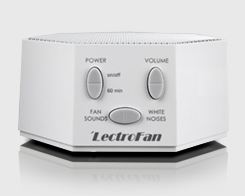 A white noise machine creates this shushing noise, without the risk of you running out of breath. This sound triggers the calming reflex in baby, allowing her to get back to her normal state. White noise can come from a variety of sources. White noise sound for a newborn’s nursery can come from apps for Android and Apple that play white noise, a radio tuned to an AM station, or sound machines, to name a few. “Frequently Asked Questions | Colic Baby Solution – The Happiest Baby On The Block.” Colic Baby Solution The Happiest Baby On The Block RSS. Web. 16 Sept. 2015. “What Is SIDS? An Overview for the Science-minded Parent.” What Is SIDS? An Overview for the Science-minded Parent. Web. 16 Sept. 2015.